The best part of my two week Alaska trip was visiting the bears in Katmai National Park and Preserve. I signed up for the Classic Day Trip which takes about 7 hours of the day for 3 hours with the bears and is very pricey but worth EVERY penny on a sunny day. I was thrilled that the weather was so nice for my bear trip that started at 6am which was dependent on the tides. Upon booking the trip many months in advance, I had to provide my fully clothed weight and stay within 10 pounds or risk losing my spot according to Alaska Bear Adventures. The day before the trip, all clients had to visit the office to weigh on their scale and go over all the rules which included no aerosol bug sprays, no bear spray, no plastic bags, no glass bottles and more. Everyone arrived at the hanger by 6am for a safety briefing which spent more time on the Cessna airplanes that we would be flying in than the Alaskan Coastal Brown Bear. In addition, each of us was provided a set of patched waders that fit over our shoes and a life vest. After going through all the rules, we followed the pilots to the tarmac. Each plane carried five passengers and the pilot. Four planes would be flying us to the beaches at either Katmai National Park and Preserve or Lake Clark National Park & Preserve. The destination was determined that morning…Katmai which was slightly farther away. I ended up with Joe and a group of four tourists from Poland of whom two didn’t speak English. We put our packs, that couldn’t weigh more than ten pounds, in the back of the plane and then Joe distributed us based on our weight. I got the front seat! The crystal clear skies provided superb views of the surrounding mountains, volcanoes and bay below. Three of the planes flew closer to land where they spotted a few bears and landed on the beach. Joe continued on for a glance at the another beach and counted five bears immediately. He landed on this rocky beach and what a fantastic decision it was! In the three hours we got to spend with the bears, we saw about 15 different ones! Some groups have to hike up to five miles to see the bears, and we never left the coast (about a ten minute walk from the plane), and sat on the sand in front of Hallo Glacier. To visit the bears, we were required to walk in a single file line as to look small and less threatening. Once we got to within 25 yards of the bears, we quietly knelt down in a close group. At that point, we kept from making noise or from making quick movements and sat by the bears for the next three hours, only moving once simply to get the sunlight behind us for photographs. No sooner did we kneel down than a mama bear dug a day bed in the sand, rested on her back, and began nursing her large cub! We were all amazed we could be so close to a mama and her cub and not be in danger. 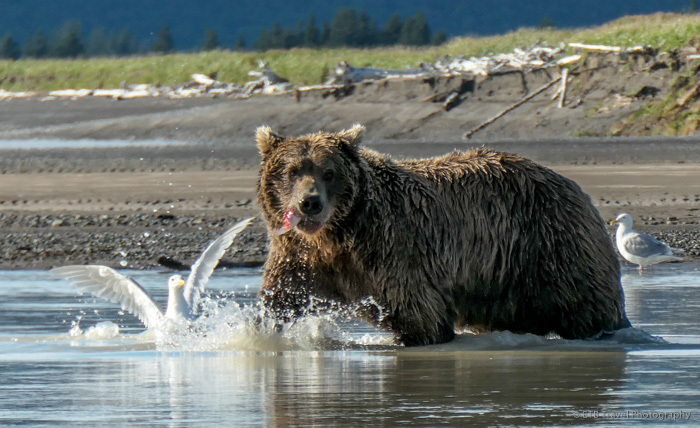 The Alaskan Coastal Brown Bear is larger than the Denali grizzly, has never been hunted and doesn’t associate humans with food. Virtually their only interaction with humans are those who watch them. As such, Joe said the mama actually used us as protection. She was able to nurse her cub without having to worry about other bears. While she was nursing, another female was fishing in the low tide pools. Lefty, a large male missing most of his left ear, noticed the female’s success and trotted across the water to steal her fish as the birds swarmed. A few other cubs were also enticed by the commotion and headed that way. Fortunately for the female, none of the bears took her fish, and she promptly caught another one. Meanwhile, the mama and cub decided to take a nap while a bald eagle landed in between them and a glacier…the Alaska trifecta! Next, we watched three cubs play as they rolled around in the sand. Once they rested, we turned out attention back to the mama and the cub that were stirring around as other bears started appearing on the beach from the distance. We were surrounded by thirteen bears! Fortunately, it wasn’t an unlucky thirteen! We watched bears scratch their ears, mama’s keep a close eye on their cubs as they frolicked in the water, dig more day beds, rest, and gallup through the water as they timed their plunge to catch the swimming salmon. It was just so exciting!! Camera shutters didn’t stop…click, click, click. I even managed to take a few short videos when one bear circled us close enough to make us hold our breath. See 5 second video HERE. After what I thought was an hour, I turned to Joe, who was almost like my private guide given the Polish folks spoke limited English and the other groups landed on a different beach, and said I should probably put on some sunblock. It would be ironic to come home sunburned after spending 11 out of 14 days in Alaska in the rain! Joe replied, “Well, we only have ten more minutes.” Seriously!?! I was in complete dismay as I’m usually good at telling time…no wonder I was hungry. As we returned to the plane, one of the mama’s and her three cubs who were all part of the show crossed our path as they wandered away and others sort of followed us back to the final tide pool that we had to cross. Upon reaching the plane, we were rewarded with a bald eagle and eaglet. In addition, Joe treated us to a spectacular flight back over volcanoes, lakes and glaciers. I absolutely LOVED this trip and HIGHLY recommend it. Of course the nice weather helped, but I heard there a trips that have a camp in the area and visitors can spend four nights with the bears. I may have to come back!!! SO, SO AWESOME! LOVE YOUR BEAR PHOTOS!!! You had some spectacular views as well! Omg what an amazing trip! This sounds so wonderful!